Heat oven to 400 F. Place cod filets in cast iron skillet, or oven-proof baking dish. Place parsley, olive oil, garlic, shallot and salt in food processor; pulse until combined, then brush mixture over cod filets. 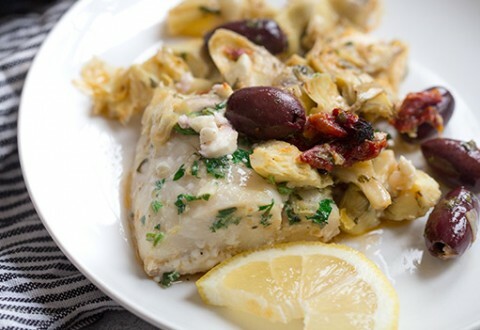 Fill skillet/baking dish with sun-dried tomatoes, artichokes, olives and feta cheese, making sure to cover the filets. Squeeze lemon juice over entire dish. Bake oven for 15-20 minutes, until fish is cooked through and flakes easily.